Joyce, I find it interesting that star anise is used in a cake. The friands baked beautifully and I love that it is studded with bleuberries. I know I will enjoy it very much! It looks as though your new oven is working! Your friands look so pretty and very moist. 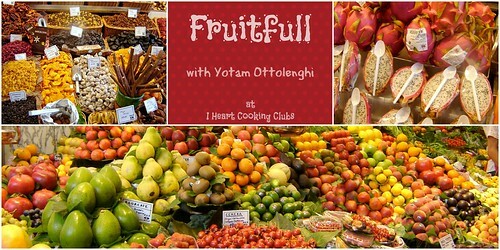 I agree that Mr. Ottolenghi is very clever at combining flavours in sweet as well as savoury dishes. Star anise with blackberries/blueberries sounds delicious. I love star noise ! It must be flavorful! Star anise in blueberry friands....they sound and look divine, Joyce. Star anise, i remember i accidentally bite it during my childhood when eating at grandma's house and my tongue feel numbness. I can still remember the feeling. But seems that you grind it until very fine for this cake! Delicioso me encantan las bayas,saludos y abrazos. Thank you so much for sharing, I'm glad you went with the blueberries, Joyce. The crop is exploding this year and they are everywhere! Hi Joyce! Like many others, I have not used nor tasted star anise in cakes before. This will be an interesting one for me! They turned out perfect!! Love that pan!! oh! I love these so much! What an interesting combination, I rarely use star anise, I must try with blueberries! Adorable little cakes! And a new flavour combination for me :) Always something new & different from the talented Mr Ottolenghi! I have never heard of a friand before, but they look very pretty! I love that you substituted with blueberries (one of my faves). How interesting to grind the star anise. I can almost smell these baking now! I just love the flavor of Anise and with the blueberries it would be delicious. Can't wait to taste this one. Hope you are having a great summer weekend and thank you so much for sharing with Full Plate Thursday. Joyce, I love your pan! Wonder where I can find that? Have never baked with star anise but I can imagine the flavours it would impart to the bake with blueberries... I would like a piece! i think i will be as curious as you about the star anise in cakes. You have baked these in the friand pans beautifully and i can see that it has a lovely texture! Ok, so now I need to break out my friand pan that I have yet to use. These look deliciously moist, and what an intriguing flavour combination. Never would have thought to use star anise in a friand - Ottolenghi surprises us once again. These look perfectly baked...just perfect, Joyce! Thank you for linking up. I've gotten behind and apologize for being so late to stop in. Joyce , such an interesting combo ! I wonder what the taste like :D The friands look dainty and yummy !